The Storm Wrought Ballista Trap is a Draconic type weapon. A vortex of thunderous bolts fire endlessly from this Storm Wrought Ballista Trap. Enhanced by dark dragon magic drawn from Ful'Mina's powerful tooth, its powerful storm vortex can rip an additional Dragon Scale from the clutches of its victims. The Storm Wrought Ballista Trap is not sold by any Trapsmith. It can only be crafted given the proper ingredients. Arming the Storm Wrought Ballista Trap can add 1 Dragon Scale to Storm Dragons which already drop Dragon Scale(s). Smashing this weapon with the Hunter's Hammer yields Storm Wrought Ballista Trap Parts. 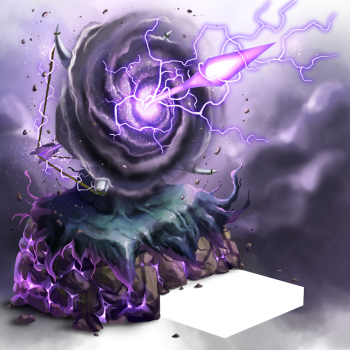 24 July 2018: The Storm Wrought Ballista Trap was made smashable during Ronza's 2018 Visit. 6 September 2017: The Storm Wrought Ballista Trap was introduced with the release of Moussu Picchu.